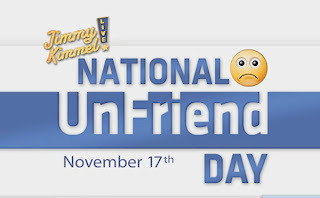 Yesterday, an old high school friend mentioned deleting a large number of friends in honor of National UnFriend Day ... Jimmy Kimmel is the cruel culprit and cause for careless random unfriending this week. I realize it is pathetic to admit I care, but I do. Remember my post regarding Facebook unfriending and deleting back in June? Sadly, the truth is, Facebook has become my lone lifeline to certain old friends and even family members. Gone are the days of emails, texts and phone calls (remember phone calls!) ... Today I find out about friend's pregnancies, divorces, engagements, new jobs and other big events via Facebook. For example: an old friend once threatened to delete her account and I felt my heart drop. She rarely replies to texts and is too busy for phone calls, so my only link to her at this point is Facebook. Then again, maybe without Facebook, she will be forced to pick up the phone again the way we did back in 2003. Friends who have moved away and purchased new homes I may never see, I get a glimpse into their world through their Facebook albums. Old buds or former work associates I don't really speak with keep me posted on their new babies and important career moves via FB. I'd never know otherwise. Can anyone relate to this? These days I've found myself too busy or too tired to chat on the phone, but I welcome a private message sent through Facebook. So drop your friends a line, let them know what you're up to and think twice before unfriending someone who really does care. WodMy heart hurts whenever I see that number go down. Man, why would he do that? I'm an emailer and a texter. I don't like to talk on the phone and, as of right now, I have a little over 1,000 rollover minutes to use before the end of the year. I totally agree with this post. When I first heard about it, I was really shocked. I also use Facebook as a medium for keeping up with old friends, and otherwise I'd never know what's going on with them! It hurts to be "unfriended" by someone...I mean, Facebook friendship is a pretty loose tie, but deleting means "I dont' even care enough about you to read a status message". It's brutal! It happened to my sister -- she was unfriended by a mutual friend of ours and was very hurt by it. I told our friend how much it hurt and my friend was devastated...she had no idea that it meant so much to my sister! It's way more than just a fun way to play. I was just telling my husband this last night. It seems we all moved from phone calls and visits to email and now email is being replaced by FB, text and Instant messages. And I have been unfriended without having any inkling as to why because I'm not one who airs all my dirty laundry and drama on FB for everybody to see and can't think of anything I could have done to offend someone. It defnitely stings to be unfriended and I had not heard about Jimmy Kimmel's little UnFriend Day. That's just warped. Facebook is a great place to stay up to date with old friends. I actually use it very little. I also have a cell phone, and all I do is use it as a phone. No texting, no web, no, no email, nothing but a phone. It's my way to kind of keep in touch with everyone without losing the personal touch of voice. I still have email on my computer, but that's the only place you can electronically talk to me. I actually have no idea how many facebook friends I have. If I was unfriended yesterday, I have no way of knowing about it. I don't mind the Unfriending thing, because I ended up accepting friend requests from people I'd lost contact with, only to realize through their dozens of inane status updates every single day, that maybe there was a reason I didn't keep up contact. I pretty much use FB as a way to keep in better contact with the people I was already in contact with anyway. I loathe the phone! I may or may not be the person when the phone rings I will pick it up and hang it right back up because I hate it that much...thank god for caller ID! I live 300 miles from my family. I did un-friend my niece a few months back. Reading her self-analysis in a "How good am I in bed?" survey/post did it. She's not married, and while I don't approve of her lifestyle, the last thing I want to do is read about things like that. I mean, REALLY, even if she were married... why would you put that out there? Have we no dignity left? Way TMI! I was not a fan of this. I think getting unfriended hurts a little anytime it happens, let alone making people feel empowered to do so on a certain day. I also don't think facebook devalues the word friend. In fact, it amazed how much I see that I have in common with people I never even thought twice about. I know what you mean but I suppose the 'unfriending' is necesary for people who may have added just anyone and everyone. I'm not one of those people but I still worry about some of the acquaintances I've added. I have to be quite careful about what I put on mine because I forget about the people who might not comment but still read everything I say so I've been thinking about unfriending. I also worry about friends who DO add anyone they know who can also read my comments if I comment on their posts (this is getting confusing). I've been debating droppign some 'friends' but there seems to be something cold about it. We should start national re-friend day! I only understand unfriending if the person annoys the crap out of you not because you don't talk to them ever. I especially don't understand them unfollow people on blogs. It hurts a little and I cry myself to sleep. I feel the same way about cards and letters. There's that new app, too. The one that tells you who has recently unfriended you. By the way, I'm a new follower of yours. Good Lord, this is why I don't do Facebook!